Give off a refreshing white illumination without glare and harsh shadows, turn the night into day, diffused light enhances visibility inside the room. Save 90% on electricity bill. Ceiling fan light: Uplights projects light up onto the ceiling, creating ambiance; Downlights enhances visibility inside the room. Chandelier. Used as decorative focal points for rooms. Make sure the dimension of the bulb with the last image when you order it for use in a slot, such as a vent hood or enclosed sconce socket. ✔ Great Replacement of Traditional Halogen Bulbs. As bright as 40 watt halogen bulb, consuming only 10% of energy, provides 400 lumens of light output and a true 6000k daylight white color. Not blueish. ✔ Optimal Efficiency. Save 90% on electricity bill of lighting. Save effort and maintenance costs on changing bulbs frequently. Work perfect on full power, very little heat output. ✔ No Yellow Glow. 6000k daylight white, provide a refreshing bright white light without glare and harsh shadows, turn the night into day, diffused light enhances visibility inside the room. Zero harsh glares prevents eye fatigue. ✔ All you can expect. 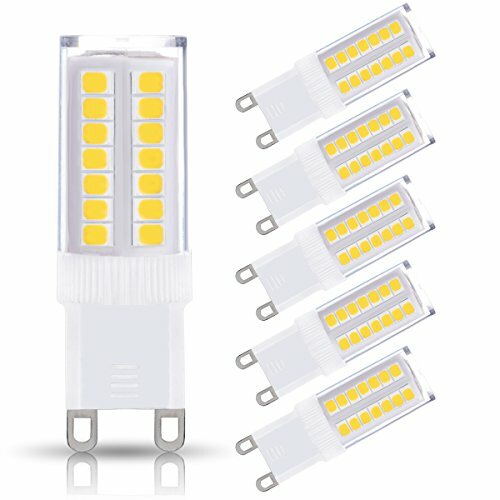 Big savings, tiny size, visually appealing, super bright, durable, no flicker, long lifespan and safety guarantee. Last 30,000hrs, this G9 Led bulb has an 1 year warranty. If you have any questions about this product by JandCase, contact us by completing and submitting the form below. If you are looking for a specif part number, please include it with your message.